In medieval terms, a crypt is a stone chamber or vault, usually beneath the floor of a church or castle. It was used as a chapel or burial vault, possibly containing sarcophagi, coffins, or relics of important persons, such as saints or high ranking church officials. Crypts are usually found in cemeteries and under public religious buildings, such as churches or cathedrals, but are also occasionally found beneath mausolea or chapels on personal estates. Wealthy or prestigious families will often have a family crypt or vault, in which all members of the family are stored. Many royal families, for example, have vast crypts containing the bodies of dozens of former royalty. While crypts were originally designed for practical purposes, as well as to honor the dead, for many their existence evokes a sense of fear and the possibility of evil. Much of this is due to the association between crypts and vampires, extended into the horror genre in television. However, it also reflects the discomfort people feel in enclosed space in the presence of dead bodies. Whether or not this is related to the spirits of those whose bodies are present, it does indicate that the human connection to the dead is not altogether comfortable. The word "crypt" derives from the Ancient Greek, kruptein, which means "to hide." It later changed into kruptos, which means "hidden," and then to the Latin crypta, which described a "grotto, or hidden vault," attesting to the will of Church officials to keep bodies and relics hidden and safe. Towards the time of the Middle Ages, the term took on an occult connotation, and was sometimes used to describe a meeting place for secret groups and societies. 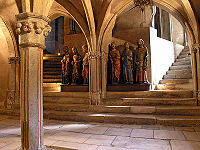 Crypts are typically found below the apse, such as at Saint-Germain en Auxerre, but occasionally are located beneath church wings and naves. They can range in size, from a single, small room, to a series of rooms that make up an entire subterranean level to the church. They are almost always made of stone, often have vaulted ceilings, and were able to be used for both storage and worship. A burial vault is a structural underground tomb, the current day equivalent of a crypt. It is a stone or brick-lined underground space, or "burial" chamber, for the interment of a dead body or bodies. They were originally, and are still often, vaulted and usually have stone slab entrances. They are often privately owned and used for specific family or other groups, but usually stand beneath a public religious building, such as a church, or in a churchyard or cemetery. A crypt may be used as a burial vault. In some localities an above ground crypt is more commonly called a mausoleum, which also refers to any elaborate building intended as a burial place, for one or any number of people. 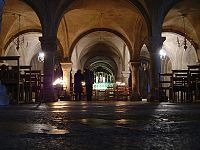 The crypt developed out of the early Christian Church's desire to keep the bodies of their clergy and congregation, as well as important relics, safe. Instead of using cemeteries as burial places, underground chambers were built beneath the safety of its churches, much akin to the early catacombs of the era. However, the distinction between the two came later, as smaller, less complex crypts were easier to build than large, complex tunnel systems, especially when constructed under smaller churches. One of the first such crypts was built at Ravenna, Saint Apollinare in Classe, in the year 534 C.E. For many centuries afterwards, crypts were commonly constructed beneath churches throughout Europe. After the tenth century the need for crypts faded, when Church officials permitted relics to be held in the main level of the church. By the Gothic period crypts were rarely built. The crypt at the Lund Cathedral, Sweden, has remained largely untouched since its consecration in 1123. The crypt is identified by its numerous and densely built pillars. The pillars are all very different in style and were built by the architect Donatus. The most famous pillar is the one with the statue of a man embracing it. Local legend tells that the figure is Finn the Giant, builder of the cathedral. 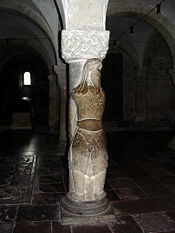 Another column has a similar sculpture of a woman, the wife of Finn according to legend. It is not known who the man on the column actually represents, but it could also be the Biblical character Samson. The crypt's main altar is the oldest altar in the church and was consecrated on June 30, 1123, by archbishop Ascer. The crypt contains many sarcophagi, chests, and grave slabs. Among its most important works of art is the relief decorated well and the tomb of archbishop Birger Gunnarsen, created by Adam van Düren in the 1510s. According to legend, the crypt may be the final resting place of the great hero Fionn mac Cumhaill, about whom legends abound in Irish and Scottish mythology. One of the oldest and most famous cathedrals in England, Canterbury Cathedral, also houses the largest and oldest crypt in the country. Originally a Saxon church, the Norman Archbishop Lanfranc rebuilt it during the eleventh century, adding a large crypt beneath. Entombed in the crypt are many important religious figures who at different times occupied the Church, including Thomas Beckett. Crypte de la basilique Saint Sernin, Toulouse, France. Famous for being one of the oldest Romanesque Churches in Europe, the Basilica Saint Sernin, in Toulouse, France, houses a large number of relics in its ancient crypt. They have been on display in the crypt since the seventeenth century and consist of the remains of saints, including Saint Saturnin, who was originally entombed in a small, simple, wooden structure. Later, a crypt and the cathedral itself was built around the proposed site of Sernin's tomb (for no one was sure of its exact location), and many bodies and relics were added to the crypt. The cathedral and crypt became an important destination along the Saint Jacques de Compostelle pilgrimage route. Tomb of Franz Josef I, flanked by wife Elisabeth and son Rudolf. Since 1633, the Imperial Crypt in Vienna, in German: Kaisergruft but usually called the Kapuzinergruft ("Capuchins' Crypt"), has been the principal place of entombment for the Habsburg dynasty, hereditary Emperors of the Holy Roman Empire, and their descendants. The Imperial Crypt lies below the Capuchins' church (the Church of St. Mary of the Angels) and monastery founded in 1617, and dedicated in 1632. It is on the Neue Markt square, near the imperial Hofburg Palace. 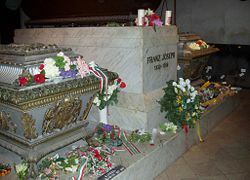 The bodies of 142 aristocrats, plus urns containing the hearts or cremated remains of four others, are deposited there (as of 2005). They include 12 Emperors and 18 Empresses. From other families, there are 32 spouses, plus four others, who have found their resting place there. Over the years, along with cemeteries and catacombs, crypts have been incorporated into the horror and science fiction/fantasy sub-culture, particularly associated with vampires. It was Bram Stoker's original Victorian novel, Dracula, that identified the vampire's resting place as a crypt. Since then, crypts have often been cited as places occupied by ghosts, spirits, and other creatures, usually malevolent in nature. A popular televison show in the 1990s, Tales from the Crypt, featured a creature called the Crypt Keeper as the narrator of episodic tales of horror, furthering the widely perceived notion that crypts are frightening places. Just as with catacombs, these feelings most likely developed out of the dark, subterranean nature of crypts coupled with the discomfort people naturally feel when placed in a enclosed space with a dead body. ↑ The American Heritage Dictionary of the English Language, Crypt. Retrieved September 13, 2007. ↑ Lunds domkyrkoförsamling (2007) Welcome to the Cathedral of Lund. Retrieved September 13, 2007. ↑ Canterbury Cathedral (2007) Home Page. Retrieved September 13, 2007. ↑ Philippe Maudelonde, Inside the Basillica. Retrieved September 13, 2007. This page was last modified on 18 December 2014, at 22:48.